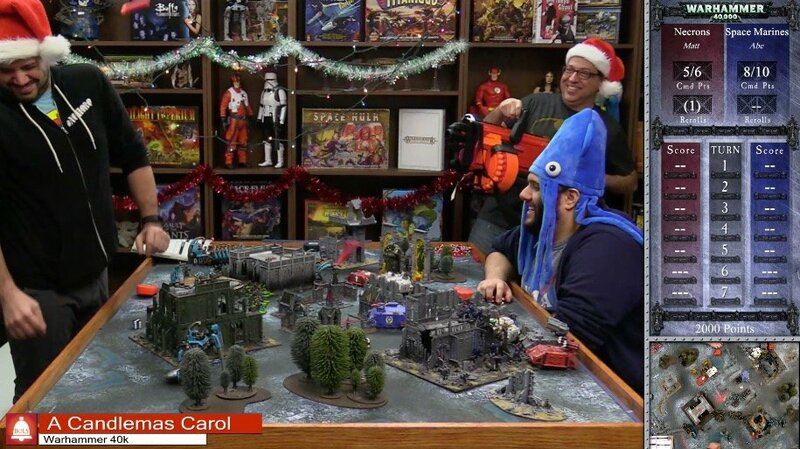 Today “Scrooge” Guilliman must fight off the Ghosts of Candlemass Present (Chaos) to save the holiday for the children of the Imperium! Having awakon from his the visions granted him by the Ghost of Candelmass Past, Guilliman took a few moments to compose himself. Then through a door a strange voice called him by his name, and bade him enter. He obeyed. It was his own room. There was no doubt about that. But it had undergone a surprising transformation. The walls and ceiling were so hung with living green, that it looked a perfect grove; from every part of which, bright gleaming berries glistened. The crisp leaves of holly, mistletoe, and ivy reflected back the light, as if so many little mirrors had been scattered there; and such a mighty blaze went roaring up the chimney, as that dull petrification of a hearth had never known in Guilliman’s time, or Sanguinius’, or for many and many a winter season gone. Heaped up on the floor, to form a kind of throne, were turkeys, geese, game, poultry, brawn, great joints of meat, sucking-pigs, long wreaths of sausages, mince-pies, plum-puddings, barrels of oysters, red-hot chestnuts, cherry-cheeked apples, juicy oranges, luscious pears, immense twelfth-cakes, and seething bowls of punch, that made the chamber dim with their delicious steam. In easy state upon this couch, there sat a jolly Giant, glorious to see, who bore a glowing torch, in shape not unlike Plenty’s horn, and held it up, high up, to shed its light on Guilliman, as he came peeping round the door. `I am the Ghost of Candelmass Present,’ said the Spirit. `Look upon me.’ And with that the Spirit took him way, granting him a vision of the present, as he and his forces battle their old brothers. “Sanguinius was dead: to begin with. There is no doubt whatever about that. The register of his burial was signed by the High Lord, the clerk, the undertaker, and the chief mourner. Guilliman signed it. And Guilliman’s name was good upon ‘Change, for anything he chose to put his hand to. It was the day before the Imperial holiday of Candlemass. Normally this would be a day of great joy and celebration in the Imperium. 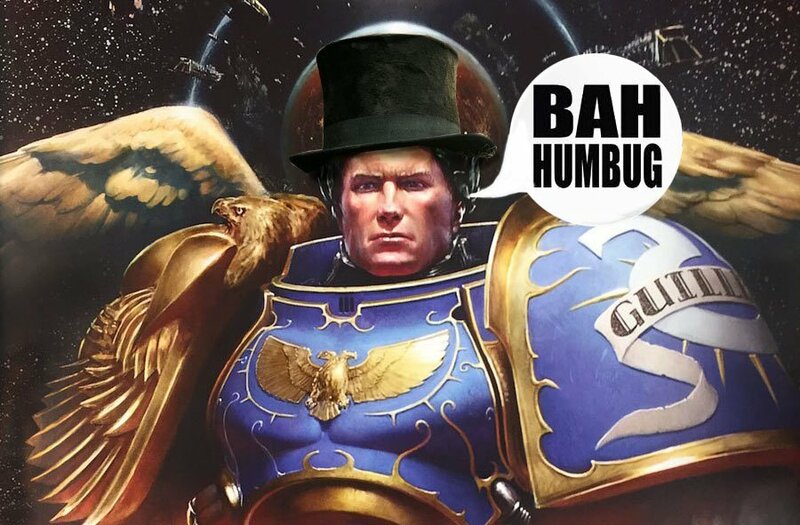 This year Guilliman has ordered that everyone must work through the holiday, making ammunition for the war effort. Even the factories that would normally turn out STC complimentary gift for all children must instead make guns and ammo. Even Guilliman’s own clerk must work through the day, though he is worried about his son, Tiny Tau Empire, the poor boy is sick and his battlesuit crutch is no longer enough to keep him healthy. There is no rest for anyone. That night however, when Guilliman returned to his chambers he was greeted by a most disturbing sight. Before him appeared the ghost of his old brother Sanguinius. Sanguinius, warned Guilliman of a dire fate about to befall him, but one that Sanguinius hoped he could still avoid. To that end Guilliman was to be visited by three spirits. Guilliman must listen to them or the worst shall happen. With that the winged ghost vanished. First that night came the spirit of yet another brother, with silver hands and carrying his own head. “I am the spirit of Candelmas Past.” The spirit told him, and with that whisked him away to past times, happier times, when he and his brothers fought together and the future was still bright.